We’re going to attach dots to our AirPods to make them fit better. This tip was inspired by a 2017 post on the MacRumors forums by member NewZealandMatt. 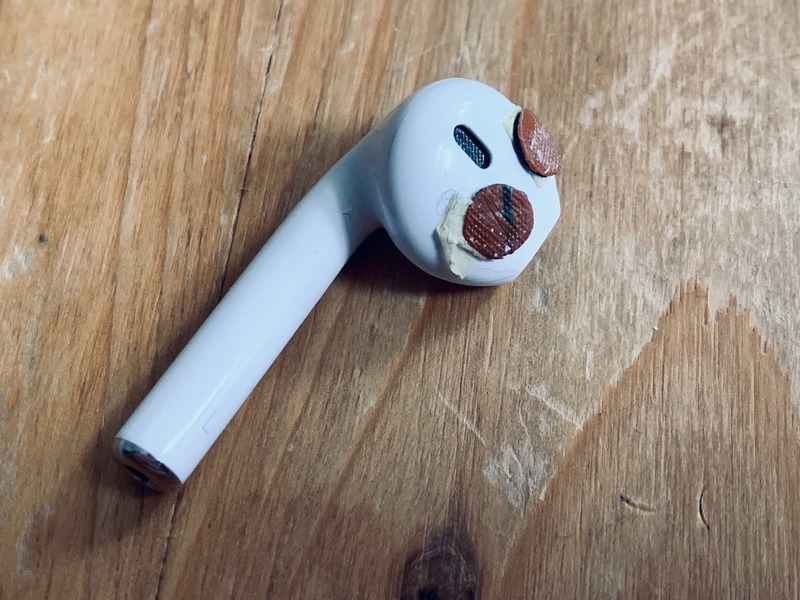 Matt cut circles from a special spongy tape, and stuck them onto the AirPods. The placing of these dots is the crucial part. If you get it right, they make the AirPods big enough to fit tighter in the ear, but they don’t get in the way when you drop the AirPods back in the charging case. For anyone whose ear-holes are too big for the AirPods, it’s definitely worth giving this a try. And my version doesn’t use any special tape. It can work with stuff you already have laying around the house. A bike puncture repair kit, or at least a patch. A hole punch, the kind used for paper. 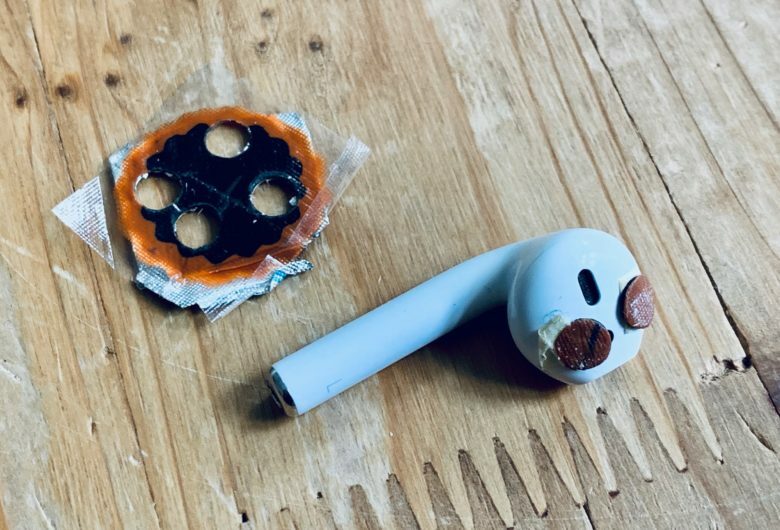 We’re going to punch out four dots of rubber from the bike tire-repair patches, and stick them on the AirPods. The tape is there to test-fit the dots, and the glue is there to make it permanent. This seems to be the optimal placing (roughly). First, punch out four dots. I picked tire-repair patches partly because I have them already, and partly because they are tapered toward the edges, so you can get different thicknesses depending on where you punch. But anything will do. Just dig around in the junk drawer until you find something suitable. 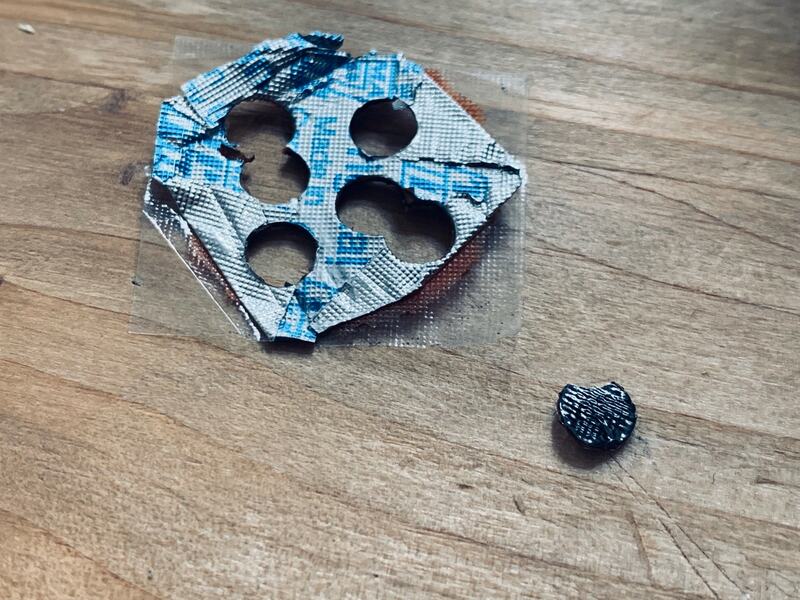 Then, use the tape to stick the dots onto the AirPods. This arrangement may make the AirPods fit better in your case. I roll masking tape over on itself to make a double-sided loop. You can use double-sided tape, too. 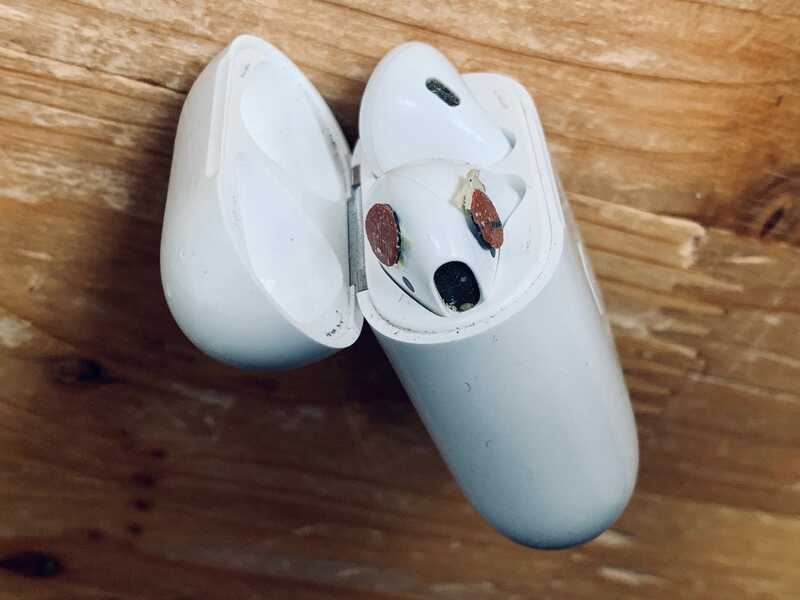 Make a test fit with one AirPod. Check it in your ear, and in the case. And remember, the tape itself has thickness, so when you switch it for glue, the fit may change a little. When you’re happy, make the final attachment. Superglue/Krazy Glue (cyanoacrylate) is easiest, but also hard to remove if it all goes wrong. In fact, due to the ridiculous lack of personal responsibility these days, and the tendency to blame (and sue) anyone else when things go wrong, I recommend definitely not using it. You could end up with AirPods stuck in your ears, or stuck in their case. Instead, pick your own glue. And make sure it’s dry/cured/set before putting the result anywhere near ears or case. Another fantastic option is Sugru, which is a kind of moldable silicone putty that sticks to anything, and sets hard overnight. I use Sugru for all kids of repairs and modifications. Just make your dots with it, and leave the AirPods out in the air to cure. The problem with Sugru in this case is that test-fitting is hard, as the putty is too soft. Also, make sure you have an extra Sugru project lined up, as once you open a Sugru pouch, you have to use it all at once. And now you’re done. Your AirPods fit you better, and if you set it up right, they still drop into the charging case. Thanks to NewZealandMatt for the great idea.